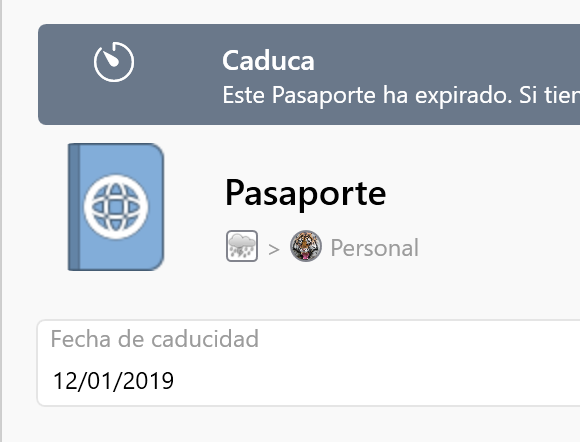 The detection of expired items does not work correctly for me and I think there is a problem with the date, at least in the case of OS in Spanish. I think the problem could be related to the format of the date in Spanish (dd/mm/yyyy) used by the OS. 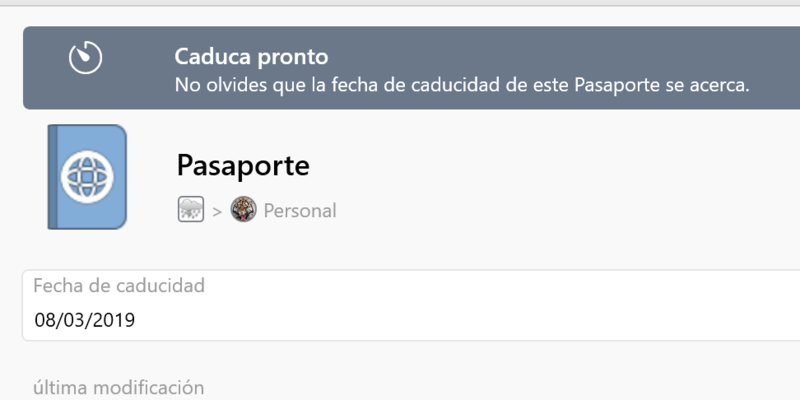 My windows is in Spanish and setting 1P7 in both English and Spanish, in both cases the format of the expiry date field indicates dd/mm/yyyy and in both cases the expiring items detection doesn't work fine. I guess 1P7 always uses the OS date format. I have also tried using the English format (mm/dd/yyyy) but the results I think are even getting worse. Of course, the date, time and time zone of the OS are correct. That could be happening ? The date fields are converted to a timestamp that doesn't need time zone or localizations, so as long as you use your OS format to save the date, it'll be converted into a timestamp that we can later convert to the right date regardless of the OS settings you're using. Here's what I'm doing, please let me know if something looks different. In addition, the time in advance for the Expiring Soon items is different depending on the category. Just so I'm clear, everything is fine now but it wasn't clear enough that there were two different statuses. We'll see if we can slightly adjust the banners to make it different a bit.